Translators had the perfect excuse to get out of the house on Sunday, June 13, and enjoy a wonderful, sunny, and slightly windy day at our annual NCTA Picnic at beautiful Paradise Beach Park in Tiburon! 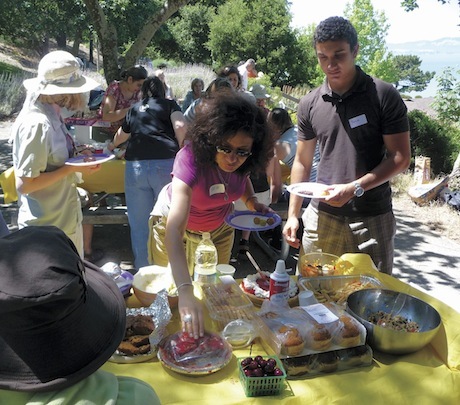 The park, located in the Bay Area’s beautiful Marin County, was an outstanding background for all the translators and their families to gather under the sun and enjoy delicious grilled and barbecued meat, along with other healthy food. What a great way to start the first summer of a new decade! What a beautiful, enjoyable Sunday, after several weeks of gloom and rain! We all know it was a miserable, cold, and wet winter, and most of us were stuck in our offices, so I personally enjoyed getting out on a Sunday and joining people who do the same kind of professional work. It was like a corporate day out for freelancers. Since I just recently joined the NCTA last year, most of the translators were unfamiliar faces—I might have seen them at one or two of the meetings in downtown San Francisco, but no more than that. Here was another perfect excuse to dust off our social skills, so undermined due to our way of doing business. We were able to get to know each other better socially, instead of just being at a meeting or exchanging emails. The event was organized by our beloved Raffaella Buschiazzo on the first Sunday after the start of the South Africa World Cup. Maybe that’s why some of us, including myself, showed up late after watching Germany defeat Australia 4-0. The food everyone brought was great! I had the opportunity to enjoy some tasteful Afghan skewers and a delicious Russian potato salad. That’s something you don’t experience every day for sure. After lunch, Marina Kopinec and her friend Tony performed an elegant dance for and we all enjoyed post-lunch conversations. Nina posted this article under NCTA Events	on Wednesday, September 1st, 2010 at 12:07 pm	You can follow any responses to this entry through the RSS 2.0 feed. Both comments and pings are currently closed.